A journalist. A lawyer. A systems analyst. Behind the propagation of the words and philosophies of team Anna is a core group of 12 dedicated individuals, some of who have quit their jobs to work full time for Anna's cause. Sahim Salim meets a few of them. Anna Hazare and his team's Jan Lokpal Bill has become a household name, and seems to be everywhere: newspapers, web portals, news channels, social networking sites, etc. They have a Facebook page, a Twitter handle, a website, an e-mail address, and even an Interactive Voice Response system. Behind the promotion of the words and philosophies of team Anna is a core group of 12 dedicated individuals, some of who have quit their jobs to work full time for Anna's cause. The team has a lawyer, a software engineer, a system analyst, a journalist, and others whose only motivation is to keep this "worthwhile" cause alive. Most of them work round the clock, and do not expect any monetary compensation. Rediff.com caught up with some of the members of the team behind team Anna. They don't like to be called volunteers and prefer the term "Anna" instead. Chauhan works as a journalist with Navbharat Times. Currently, in order to work full time for the cause, he is on leave without pay from his organisation. He stopped collecting his cheques from his employer when a lot was happening in his personal life. Four months into his leave, Chauhan's wife gave birth to a baby boy and in the four days she was in hospital, he could only visit her for two hours. "Yes, she was furious, but that is how it is," shrugs Chauhan. Chauhan is in charge of Facebook and Twitter updates for India Against Corruption. On an average, he puts up three updates every day, each of which receives at least 150-200 comments. The facebook page, www.facebook.com/Indiacor has 2.5 lakh fans. "What is amazing about this page is not the number of fans it has. Since its birth in November, at least 60 community pages have come up from across the world, with the name India Against Corruption slash the city name," says Chauhan. "Of these, three are from the United States, one from the United Kingdom, one from Dubai and one from Singapore. There are pages from remote areas such as Silchar, Coimbatore, Bhagalpur, Benaras and other places which we could not have visited in person. Our page also receives contributions from the people," he adds. "For example, there is this cartoonist based in Delhi who regularly sends us cartoons on the movement. The movement is truly global and its online presence has taken it to places we could not have dreamed of reaching," Chauhan says. These other pages are not run by him, but by faceless volunteers in their individual capacities. Chauhan got his first taste of online campaigning, when he began a Facebook page educating people about scams that emerged during the Commonwealth Games. His campaign, which he christened Commonwealth Jhel (suffering), got about 3,500 fans and was widely reported in the foreign media. Reuters, New York Times and other publications mentioned his page and quoted him in their articles. "That was the time I came to know about the power of social networking sites. Within three short months, I was getting requests from across the country for car stickers with the logo of Commonwealth Jhel. It was during this time that I met Arvind Kejriwal through a common friend. Arvind asked me if was interested in taking care of the social networking sites for India Against Corruption and I said yes," Chauhan says. Chauhan is currently working full time for India Against Corruption. He says he is facing a financial crunch as his savings have run out. "That was where my family's support came in. I currently owe money to my father, brother-in-law and friends. But that is okay. This is a noble cause and I am willing to sacrifice for it," Chauhan says. Who are you, the people, to ask us, the rulers, how we should govern?" This, Lal feels, is the motto of the government and says it angers him to his core. The 26-year-old software engineer has been associated with the movement since Anna Hazare's fast at Jantar Mantar in April this year. He is in charge of the movement's official e-mail address indiaagainstcorruption.2010@gmail.com. On an average, this e-mail address receives 400-500 mails on any given day. 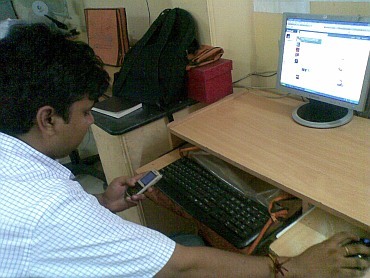 During the times when team Anna comes in the news, the address receives over 1,000 mails. Lal, with the help another software engineer friend, makes sure that most mails are replied to. The inbox of the mail address reads 20,000. "Yes, there are several unanswered e-mails too. It is impossible to reply to all the mails we receive, but we try our best. People seem to think that India Against Corruption is a huge organisation with many volunteers behind it, which is not true. This e-mail address and the scores of e-mails it receives are managed by two people!" Lal says. Lal is a software engineer by profession and works at a private company in Vaishali, Ghaziabad. He says he reaches office at 10 am and the first thing he does is open IAC's e-mail. 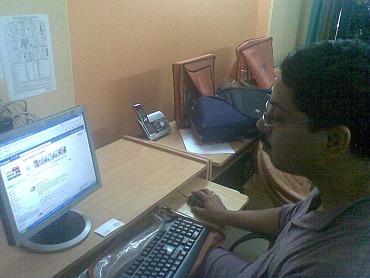 During his breaks, he tries to reply to all the mails IAC has received. He marks some of them to be sent to Arvind Kejriwal or the others. "By the time I am done with the office at about 5 pm, I would have answered about 200 mails. I reply to some mails from home after that. My friend, Ankit Kakkar, who works as a software engineer at another company, replies to whatever unanswered mails are there in the inbox when he goes in for his evening shift," Lal says. When asked if his boss does not mind him using the office computer for IAC's work, Lal says, "He is supportive on most occasions. Yes, he does occasionally lose his temper, but that is alright." Asked if his company is aware that he works for IAC, Lal points to an IAC badge pinned to his pant pocket. "I wear this all the time even at office!" he says. When Kejriwal called a meeting of volunteers at ITO post Anna Hazare's fast, Ankit was one of the first to arrive. "I loved the movement the moment I heard about it. At the meeting, when Kejriwal asked me if I could handle the e-mail, I said yes. I have been involved ever since," Lal says. He is a lawyer in the Delhi High Court. Kejriwal's famous "Joke-pal bill" comment, with which he described the government's version of the Lokpal Bill, was Kumar's accidental discovery. "I was sending out messages about the Jan Lokpal Bill. My phone's auto-correct, however, spelt it as Jokepal bill," he giggles. Ever since he got his law degree from the faculty of law in Delhi University in 2009, Kumar has been associated with Arvind Kejriwal's group, Public Cause Research Foundation. When the IAC was just in its formation stages and did not have even the Bhushans in it, Kumar volunteered to be the legal help. He was responsible for providing the legal help in drafting the original Jan Lokpal Bill with Arvind Kejriwal and others. Today, months later, he is in charge of grass-root mobilisation. 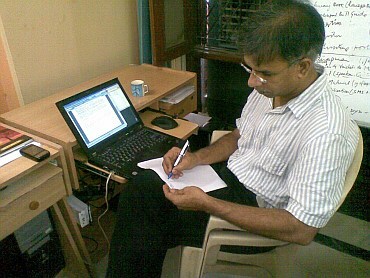 He coordinates, answers legal queries and educates citizens and Netizens about the Jan Lokpal bill. "For example, the government is trying to say that we are trying to introduce a monster bill, which will by-pass all existing authorities. That is not true. What we are trying to say is to place a system which is independent of government interferences," Kumar says. Kumar says post-April, after Hazare's fast, the movement became easier to handle. "Before Annaji's fast, people did not know what the Jan Lokpal Bill was. We would receive countless number of calls and queries from people asking us about the bill, its provisions etc. At that time, there was no media to explain to the masses. We had to reach out to them," he says. "After the fast, the media reported widely about the Bill, and now people are aware of it. Today, the queries we receive range from controversies about team Anna to the difference between our draft and the government's," Kumar says. Kumar is also responsible for coordinating with different associations in the country to enlist their support. He is currently sending out invites to associations of markets, students, religions, lawyers and other professionals for Hazare's proposed fast from August 16. Jain left his system designer job in Bengaluru to be associated with the movement full time. He was also responsible for the IAC's new IVR system (phone number 9212123212), which provides pre-recorded answers to frequently asked questions on the Jan Lokpal Bill, in Arvind Kejriwal's voice. In the 20 days the IVR has been active, the number has recorded calls from 14,700 people. "The IVR has responses from Kejriwal on various issues. The government and various other forces have been trying to destabilise the IAC movement by spreading misinformation. So we thought, why not offer an IVR where people can call and check if what they are hearing is true or not," says Jain. 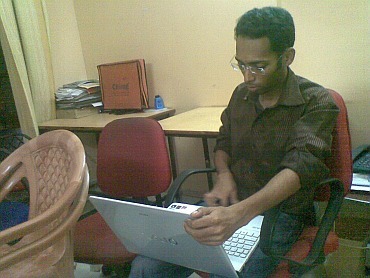 Jain is also in charge of building the new website for the IAC. "Since the traffic on the existing site has become almost unmanageable, the IAC needs a new, improved site. We hope to set it up soon," Jain says. Jain has been associated with Kejriwal since 2000. So angry is Jain over corruption that in Bengaluru last year, he had wired two hidden video-cameras and two audio recorders to assist the police in exposing a corrupt senior government officer. "I had done that with the Lokayukta. He was demanding Rs 32,000 in bribes to put a few hundred rupees worth of revenue stamps on court documents," says Jain with a smile. He is also a member of the Indian Community Activists Network, through which he met Kejriwal. So when the IAC was formed, Jain left everything else and reached Delhi to work full time with the IAC. "I have always been involved with social causes. The IAC's cause is worthwhile and I had to be here to be a part of this global movement," Jain says.